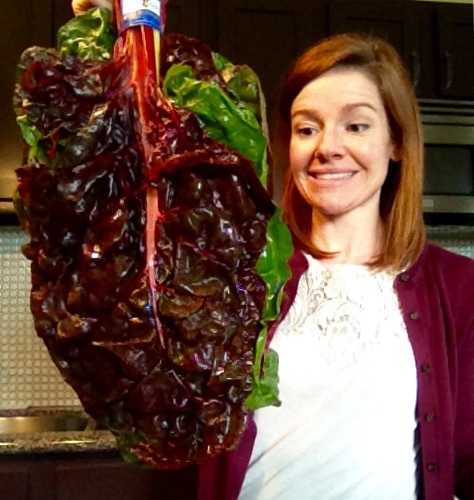 Rainbow chard or Swiss chard or Miss Chard if you're nasty. 7 calories in a cup and 44% of your daily vitamin A. It's actually a bit more mild in flavor than spinach. But don't tell Miss Chard that, she's been trying to cultivate a more exotic reputation. Try it raw, blended into your daily smoothie (my fave is vegan chocolate Shakeology, a cup of greens, 10oz water, 1/2 a banana, and 1tsp. peanut butter). It's a good idea to vary the types of greens you consume if you are regularly eating them (yes, you should be) so that you get a good mix of nutrients and to avoid alkaloid build up which can give you a tummy ache and make it so you can't tolerate your go-to green anymore.